Can an orange ever be blue? The French surrealist poet Éluard thought so, he claimed that the ‘world was blue like an orange.’ Not surprisingly, such statements spoken by the wrong person at the wrong place could have a person held and sectioned for “acting funny at the markets.” Such is the fate of Christopher, a young black man from West London who claims oranges are blue and that his father is the former Ugandan dictator, Idi Amin. 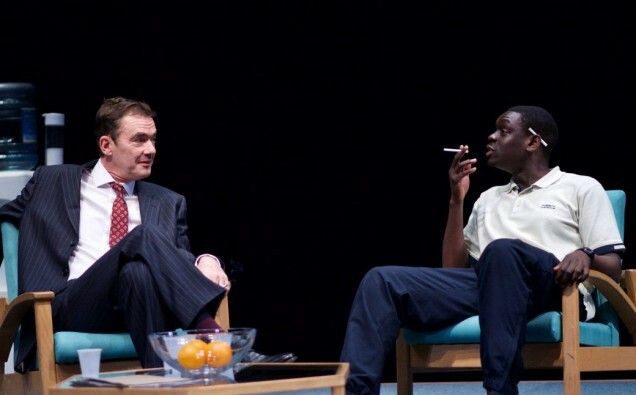 The play begins on the eve of his release after a 28-day enforced stay at a psychiatric unit. Excited by his impending release, Christopher is oblivious to the concerns of the junior doctor supervising his care, who doubles up his efforts to convince the patient and the senior consultant of his urgent need for further treatment. With conflicting diagnoses resulting in drastically different consequences, the professional discord between the two doctors heightens into personal attacks that become the focal centre of the play. The young doctor’s unconscious bias unravels as the play unfolds, startling him as much as the watching audience. His blind spots are exposed as he blanketly dismisses cultural variations in defining normality and abnormality. The senior consultant defends Christopher’s right to be angry, depressed and paranoid. However, the veneer of his altruistic sympathies soon falls away to unmask personal ambitions and grandiose theories in a bid to further his own career. Engaging and demanding, the play evokes more questions than it gives answers. It questions the methods of providing care for BAME communities in an increasingly culturally pluralistic Britain. According to NHS statistics, black and Asian people with mental health issues are significantly less likely to seek help despite being more likely to suffer from a disorder. Though the play remains unchanged since it was written twenty years ago, it’s testament to the growing need for awareness. What perhaps has changed are the barriers upholding the social stigma of mental health and discrimination. The two- week run of Blue/Orange at the Birmingham Rep is part of a season of plays on the theme of injustice that will continue with the forthcoming stage production of a Thousand Splendid Suns this coming May. Adapted from Khaled Hosseini’s best-selling novel, the focus will shift to the struggle of women in Afghanistan. It’s part of the Rep’s push to put the spotlight on stories and influences that reflect the cultural diversity of Birmingham. It’s a welcome opportunity for theatre to take centre-stage and bridge the gaps in understanding that are undermined by divisive policies in the current political climate.